It has been 25 years since the birth of the Superbike and at the Italian round at Monza, the organizing committee and sponsors of the World Championship have decided to celebrate the anniversary with a gala except at the Ice Palace in Milan. Thursday, May 2 Tissot also took part in the festivities of the evening which saw players, in addition to drivers who currently race in the Superbike Championship, the stars of the past, people who made the bike their way of life and that are in the heart and in the memories of all the fans of this great sport. 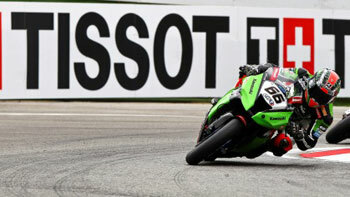 Since 2011 Tissot is Official Timekeeper and Watch the World Superbike Championship: this partnership, which is in addition to the MotoGP, Tissot makes the dominant force in the world of the timing of motorcycle road racing. The company also sponsors the Tissot Superpole qualifying session on Saturday afternoon, setting the starting grid of the main drivers in the 2 races. The award ceremony of Sylvain Guintoli, the pilot who has determined the pole, took place Sunday on the grid before race 1. The evening of last Thursday, May 3 was the occasion to present some of the most influential bloggers and online journalists in the motorcycle industry and in the so-called ‘lifestyle’, Tissot has undertaken the commitment that this partnership with a prestigious and highly responsibilities. The event was opened by brothers Paolo and Maurizio Flammini, the two entrepreneurs who promote and manage the Romans always been the SBK championship. The evening was hosted by then instead Elenoire Casalegno that, flanked by a reporter for Eurosport (which for the occasion celebrations dedicated to a direct exclusive) has introduced the ‘Magnificent 7’, the World Champions who have written the history of Championship.